Emperor X, take me away! 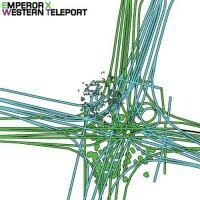 Former high school science teacher Chad Matheny returns with Western Teleport, a big frickin’ record that’s not only his Bar/None debut but perhaps his best album to date. Opening with the Fleetwood Mac-ish groove of “Erica Western Teleport”, the record develops in numerous unexpected (well, unexpected from virtually anyone besides Matheny) ways, as it drifts from the suburban dread of “Sig Alert”, into the lo-fi masterpiece “A Violent Translation Of The Concordia Headscarp” and ends with the hallucinatory “Erica Western Teleport Geiger Counter” just over one half hour after it all began. There’s an automatic quality to Matheny’s songwriting, a freedom evident in material such as “Canada Day” and “The Magnetic Media Storage Practices Of Rural Pakistan” that is enviable for its utter lack of pretentiousness, perfect imperfections and ability to touch the soul of the damaged land dweller in most of us. “Defiance (For Elise Sunderhuse)” would be a feel-good hit of the summer on some other planet, somewhere where Sebadoh, Pavement, and Guided By Voices ruled the radio waves, somewhere where you could speak the unmitigated truth the way Matheny does throughout. There are pieces that challenge the listener’s sensibilities more than others: “Anti-Rage” is not as immediately accessible as some of the others and “Sincerely, H.C. Pregerson” is far more acid-drenched than those Flaming Lips boys have ever been and you can almost feel your DNA recombining as you try to decide whether you want to stay with the song or run for more comfortable climes. Those moments converge with the more accessible ones to make a coherent statement that examines the more surreal images of American life in this new century with a poetic sense that is at once of the moment and largely of the future, uncovering truths we didn’t know we needed -- or even wanted -- to discover. In the past Matheny has created some works that were uneven in their execution (this writer once commented that the artist had made a “disasterpiece” with one particular record). But if there is an unevenness to Western Teleport it’s hard to detect or, rather, if it is there it’s as much a part of the aesthetic landscape as the odd noises that occasionally drift across the spectrum, not so much interrupting the matters at hand as enhancing them, making them fuller, more true-to-life. This is ultimately an album of its time, a portrait of the landscape, a portrait of a nation prone to disaster, decay, decline, unsure of its future but unable to make good on the promises of its past but also unwilling to revise its plans to reconcile them with this new awareness, this new world. In short, a magnificent jumble of uncertainty. It may have been a while since an artist has made such a potent statement with such mighty accuracy, without hyperbole, without the hype and self-aggrandizement that big name rockers seem to bring to such affairs when they release IMPORTANT RECORDS. If you’re looking for the real America, leave that last Arcade Fire record behind and follow Emperor X as he winds you through this troubled but necessary American life.